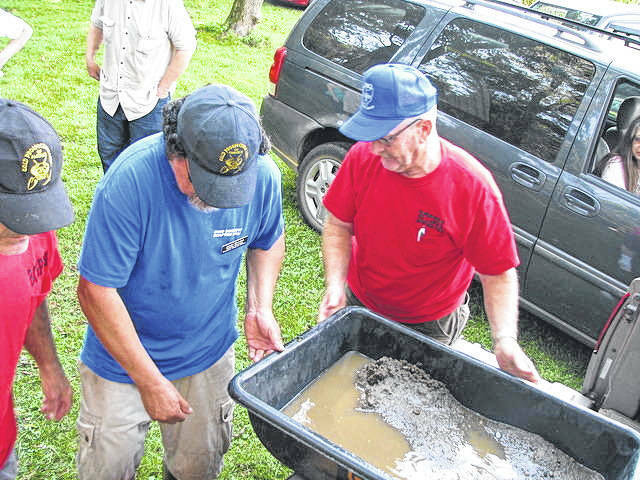 BELLVILLE —The Ohio Buckeye Gold Prospectors are holding Gold Rush Days, their annual Labor Day weekend commemoration of the 1853 Ohio Gold Rush at their Richland county claim between Butler and Bellville. Each year near the site where Dr. James Lee made the his not-so famous strike, hundreds of visitors are treated to two days of hands-on gold prospecting-related activities and competitions. The 2013 gathering promises to become the biggest gold prospecting event in Ohio’s history. The Gold Prospectors Association of America and it’s local chapters are committed to keeping the American heritage of gold prospecting alive and well throughout the nation and the Ohio contingent puts all their effort into promoting the hobby as a family-friendly outdoor activity. “The Buckeye Chapter is very active in the community.” says chapter President Tony Ledford. “Gold Rush Days has something for everyone of all ages to enjoy”. Panning for the small bits of gold which past glaciation and annual flooding has deposited into the area has become the pastime of choice for many Mid-westerners. Most prospectors will tell you that it only took finding that first tiny speck of gold to ignite a fever that lasts a lifetime and has sparked many adventures. While the gold in Ohio is fine and sparse, the skills needed to recover it are the same as those used by small-scale miners in California, the Yukon, or Australia in the 1800’s. From lessons on gold panning to common dig operations where participants new to the hobby work along with seasoned diggers using large pieces of prospecting equipment getting valuable advice and sharing in the rewards of their efforts. It’s been said that the real gold is the time spent with family and friends, bits of yellow metal are just a bonus. With free parking, admission, and many free activities, Gold Rush Days both an affordable and fun way for the entire family to enjoy the outdoors. Everything from gold prospecting related competitions, vendors, food, live auctions, kids games and more. Saturday and Sunday, September 1&2 at the GPAA Swank Property. The event is held at 1099 Cutnaw Rd, Bellville, OH 44813. For more information on the event, visit our website www.buckeyegold.com or Buckeye Chapter GPAA on Facebook. The Buckeye Chapter of the GPAA is a 501c7 Organization.